With the relative peace that was granted to the Maquis in 2372, following the start of the war between the Klingon Empire and the Cardassians, Ro was offered the opportunity to move up the Maquis ranks. She turned down the opportunity, instead settling on the Maquis colony on Galion, where she built a small house and a vegetable patch where she grew tomatoes. Despite settling down, she did occasionally leave Galion to perform missions for the Maquis. Later in 2373, before the near-eradication of the Maquis by Cardassia's new allies, Ro found herself injured and alone on the planet Sindorin. She was nursed back to health by a tribe of Ingavi that had colonized the planet, after escaping the Cardassian occupation of their own world. Soon after Cardassia's entry into the Dominion, the Maquis were hunted down almost to the last man by the Jem'Hadar, as a favor to their new subjects. Although the Maquis were dead for all intents and purposes, this did not deter Ro and a few survivors from waging their own private war against the Dominion and its allies. After the war ended several years later, Ro returned to Bajor, where she was given the rank of Lieutenant in the Bajoran Militia. Starfleet had originally wanted to have her arrested; however, she was not, due to the behind-the-scenes urging of Jean-Luc Picard. Upon receiving her commission in the Militia, her new superiors ordered her to Deep Space 9, under the command of Colonel Kira Nerys. In late February of 2376, she was assigned as the station's new chief of security. In April of that year, Istani Reyla and Gamon Vell were found dead on the Promenade. In the course of the murder investigation, Ro discovered a book of prophecies that had been written by the heretic Ohalu, some 20,000 years previously, which had been removed from the ruins of the city of B'hala by Istani. Shortly after the discovery, Ro was injured falling from the stairs in Quark's when the station shook, as DS9 was attacked by a group of rogue Jem'Hadar, hoping to restart the Dominion War. Fortunately, Quark witnessed her fall and took her to the infirmary, later sending her a bouquet of Argelian flowers. Recovering quickly, she got back to work, discovering that Reyla was killed because several members of the Vedek Assembly, led by Vedek Yevir Linjarin, wanted the book suppressed. Stating the book was evidence in Istani's murder investigation, Ro refused to turn it over. Kira interceded by giving the book back to the Vedek Assembly, but uploaded its contents to the Bajoran comnet, making them public. A few weeks later, she then returned to Sindorin, when it was discovered that a rogue agent of the independent intelligence agency Section 31, named Ethan Locken, had refurbished a Dominion Jem'Hadar factory and was creating his own army. Traveling with Dr. Julian Bashir, Ezri Dax and the Jem'Hadar observer Taran'atar, they put a stop to Locken's plans and rescued the Ingavi tribe from Locken's Jem'Hadar troops. Soon after, Ro went undercover as a Dabo girl when Quark found himself in over his head with the Orion Syndicate on the world of Farius Prime, managing to bring down the entire organization of the Orion crimelord Malic. She also freed an Orion Slave Girl named Treir from servitude. When it was announced that the documentation admitting Bajor into the United Federation of Planets would be signed on the Promenade of Deep Space 9, Ro was put in charge of the security arrangements. A member of the Trill contingent named Hiziki Gard was assigned to assist Ro and she gave him full access to her security plans. When Gard assassinated Bajoran First Minister Shakaar Edon before the documents could be signed, there was nothing Ro could do to stop him. Ro eventually brought Gard into custody, only to find out that the creature that Gard had killed wasn't Shakaar at all, but an alien Parasite that had consumed his psyche. Shakaar had already been long dead. After the resolution of the parasite crisis, Ro was prepared to resign her commission and leave DS9 with Quark, with whom she had developed a friendship. Neither of them felt that there would be a place for them in the Bajoran sector, after the planet's admittance to the Federation. It was only after the persuasion of Captain Picard, that Ro stayed with the Bajoran Militia, as it was integrated into Starfleet, with Ro once again being given the rank of lieutenant. Later, she accompanied Quark and his nephew Nog to Ferenginar, helping them maintain the rule of Grand Nagus Rom from a takeover attempt by Congressman Brunt. On 31 December 2376, Ro was attacked and critically injured by the Jem'Hadar observer Taran'atar, suffering spinal injuries and for a brief time, facing the possibility of spending the rest of her life confined to a wheelchair. Fortunately, Dr. Simon Tarses, a doctor in the station's infirmary, had developed an innovative technique that combined several experimental medical theories, which allowed her to return to duty in a matter of weeks. Despite her injuries, Ro led an investigation into Iliana Ghemor. By December of 2377, she was promoted to the rank of Lieutenant Commander. When the original Deep Space Nine was destroyed Ro waited for the new one to be completed. 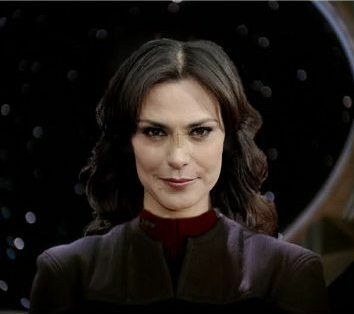 Once it was completed she was assigned to the new Deep Space Nine resuming her dual role as Security Chief and Second Officer. Commander Vaughn retired a few days after the christening of the new station and Ro was promoted to Commander and became the First Officer of Deep Space Nine(II).